Posted on May 23, 2017 at 12:52 am. 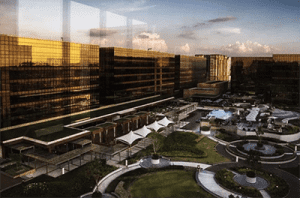 Following the joint crackdown on illegal gambling by both the Philippines and China, Melco Crown’s City of Dreams Manila is thriving. Prominent media outlet, Bloomberg, revealed last week that Melco Crown Philippines has recorded the best performing casino stock in the world this year. The casino only opened at the end of 2014 – it had a grand opening at the start of 2015 – and in 2017 shares have risen 125 percent. The country’s gambling watchdog and operator, the Philippine Amusement and Gaming Corporation (PAGCOR) recently released the resorts gaming revenue which has increased by 20 percent in the last three-quarters of 2016 in comparison to 2015. And it is reportedly predominantly because of the Chinese. “Foreign players have multiplied and they’re mostly Chinese,” a Filipino supply manager, Fernado, told the Macau Daily. According to government data, the number of Chinese visitors is up by 25 percent in the first two months of 2017, and account for around 14 percent of all visits to the Philippines. The number could grow due to a deal agreed to last year between the two countries which relaxes visa requirements. The influx of Chinese visitors is reportedly due to the Philippines President, Rodrigo Duterte, as he attempts to form closer ties with China. This coincides with the anti-gambling crackdown in mainland China, deterring VIP players from visiting Macau. Prior to President Duterte cosying up to Chinese President Xi Jinping, the two countries were at war over South China Sea territories. But as Duterte secured ties with the country last October, the casino industry started to boom. The country is also benefiting from a ban on proxy betting in Macau, as well as Singapore. So Chinese players and other gamblers can use an application – such as the social media platform WeChat – to make a bet on the tables in a Philippines casino and watch the outcome via live stream. This activity is not illegal in the Philippines. Chairman of Universal Entertainment Corp, Kazuo Okada, has even said he believes the country’s gambling sector will take over Singapore’s. The data comes as MGM Resorts declared the Philippines gambling market as oversaturated and too big of a risk to enter. It also coincides with Australian casino company, Crown Resorts, selling its remaining stake in Melco Crown. The joint venture between Australian casino tycoon, James Packer and Lawrence Ho, formed in 2004. The pair took a gamble on investing in the Philippines market and this time last year Packer thought it was not paying off. Now, it appears the Australian casino conglomerate may have jumped the gun by selling its remaining share in Melco.